Lava lamps are one of the coolest retro novelty items available today, but what if those glowing lights could pulse to the beat of your favorite tunes? 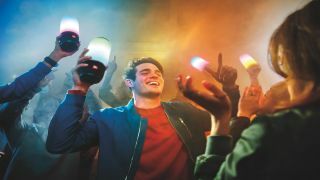 JBL first combined the glow of a lava lamp with its signature sound in a portable Bluetooth speaker about three years ago, launching the first-generation Pulse wireless Bluetooth speaker, with multiple LED lights fitted into the interior of the speaker. There's now a third-generation Pulse to light up the show – unveiled first at CES 2017 earlier this year. The JBL Pulse 3 caught everyone’s attention thanks to its 360-degree sound and 360-degree visual display. There’s been a slight change to the design of the JBL Pulse 3 since the original, other than the obvious 360-degree visuals and sound. Now the bottom part of the speaker provides the sound, with three drivers and dual passive radiators promising big sound, while the top half brings on the glow. Harman has also done away with the old outer mesh grill and replaced the exterior of the speaker with a smooth, semi-transparent shell. Poolside parties? We say, “Bring it on!” The new JBL Pulse 3 also carries an IPX7 certification, keeping it safe for 30 minutes in up to three feet of water. And with a promise of up to 12 hours of battery life, the party can keep on rocking (erm, splashing?). Using the JBL Connect+ app, one or more Pulse 3 speakers can be connected to up to 100 other compatible JBL speakers to bring the house down. The app can also be used to customize the light show to suit the party, or the mood. The JBL Pulse 3 has already made its debut in the US and the UK, priced at US$199.95/£199.99 a pop. In Australia, the Pulse 3 will hit shelves on September 15, carrying a price tag of AU$299.95. Think the lightshow of the JBL Pulse 3 is too gimmicky? We’ve rounded up some of the best Bluetooth speakers of 2017 to give you alternatives.